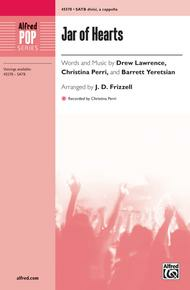 Composed by Drew Lawrence, Christina Perri, and Barrett Yeretsian. Arranged by J. D. Frizzell. Performance Music Ensemble; Single Titles. Alfred Pop Choral Series. Pop; Secular. Choral Octavo. 16 pages. Alfred Music #00-45578. Published by Alfred Music (AP.45578). Christina Perri's heart-wrenching debut single is perfect for pop a cappella groups of all levels. Recording provided by Briarcrest OneVoice, directed by J. D. Frizzell.